Scott County administrative offices are located at 600 West 4th Street, Davenport, IA 62801; phone: 563-328-3285. Photo: James Brown House, ca. 1842, 424 State Street, Riverdale, IA. Listed on the National Register of Historic Places in 1982. Photograph by user:Farragutful, 2012, (own work) [cc-by-3.0 (http://creativecommons.org/licenses/by/3.0)], via Wikimedia Commons, accessed September, 2012. Previous to 1832 the territory that comprises Scott County was an unknown wilderness. The original inhabitants of this section were various tribes of Indians, particularly the Sauks (Sacs) and the Musquakees (Foxes). In 1804 the Sacs and Foxes ceded to the United States, through General Harrison, all their lands lying upon the Rock River and much elsewhere. The principal Sac village was at a point of land between the junction of the Mississippi and Rock Rivers — just below the present site of Davenport, on the Illinois side. The Sac village was commanded by the celebrated Black Hawk, alias Ma-ka-tai-me-she-kia-kiak. The Musquakees lived further north. Notwithstanding the separation, they were, in reality, one tribe as they hunted together and had similar customs, and so far as unity of purpose was concerned, they were both enemies of the Sioux and other nations. There was a treaty as early as 1804, but Black Hawk did not acknowledge its validity. Since the whites did not seek to occupy the land until about 1830, Indians were permitted to remain, peacefully until that time. Father Marquette, the French Missionary, was doubtless the first white man that ever set foot on the soil of Scott County. Long before the discovery of the Mississippi River by Marquette and Joliet, June 17, 1673, tradition says that the spot of ground now occupied by the City of Davenport was a large and populous Indian village. At the close of a war with Black Hawk in 1832, there were no settlements on the Iowa side of the river. The purchase from the Sac and Fox tribes of the territory now comprising Scott County, was made in common with all the river counties, on the 15th of September, 1932, the treaty being held with General Scott upon a site which later became the buildings of the Chicago, Rock Island & Pacific Railroad Freight Depot. In the Spring of 1833, Captain Benjamin W. Clark, a native of Virginia, who had settled and made some improvements on the Illinois shore, where is now the town of Andalusia, came across the Mississippi, planted a crop, built a large cabin, and moved across in December following and commenced a settlement upon the present site of the town of Buffalo, and was doubtless the first settler on the soil of Scott County. His nearest neighbors at the time, upon the Iowa shore, then known as the "Black Hawk purchase," were at Burlington and Dubuque. In the fall of 1833, Roswell H. Spencer built a log cabin upon the bank of the river a little below the ferry landing from Hampton, afterward established, on the opposite side of the river to Valley City, a town laid out upon the Iowa side. This was the first settlement in what later became Pleasant Valley township. 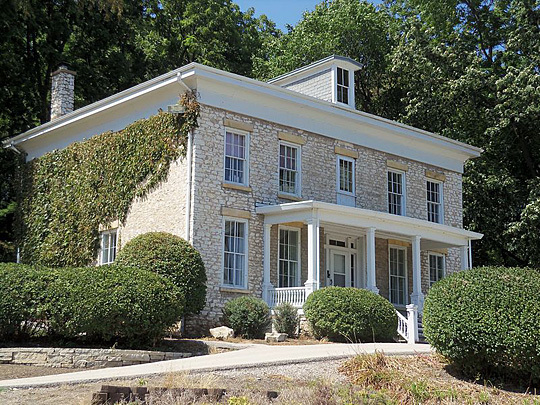 In February, 1834, George W. Harlan built a cabin within the limits of the present city of Le Claire, and was the first actual settler in that township. Eleazer Parker came next. Nathan and Martin W. Smith also came the same year. In the year 1834 Antoine Le Claire settled upon his "reserve" at Davenport. He was followed by others in due time, and one more settlement was formed. Thus began the settlement of Scott County which would go on to become one of the most populous and wealthiest in the state. History of Scott County, Iowa, Inter-State Publishing Co., Blakely Marsh & Co, Printers, Chicago, 1882.